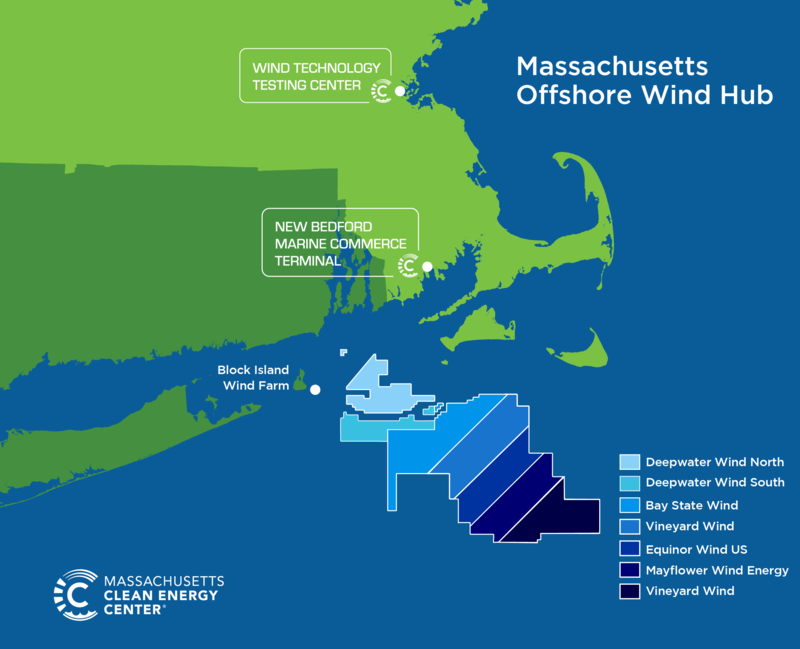 MassCEC’s Offshore Wind strategy centers on accelerating the responsible development of offshore wind projects and increasing the role of Massachusetts companies, institutions, and workers in the offshore wind industry. Toward this goal, MassCEC is leading an array of initiatives and technical analyses in close collaboration with policy makers, regulators, developers, industry and stakeholders. These initiatives are designed to establish baseline environmental data to support the permitting process, reduce development and deployment risks, advance innovation, and increase jobs and economic activity in the offshore wind sector. Offshore wind is the largest in-state source of clean energy for the Commonwealth of Massachusetts. The Commonwealth has set an ambitious agenda to become the national hub for the emerging offshore wind industry along the East Coast. Offshore wind presents an opportunity to help the Commonwealth meet its GHG emission reduction mandate, address the retirement of aging power plants, provide economic development opportunities for Massachusetts businesses, and create thousands of jobs for Massachusetts residents. On August 8, 2016, Massachusetts Governor Charlie Baker signed into law a major energy bill that is the largest commitment of any state in the nation to offshore wind. An Act Relative to Energy Diversity (H. 4568), requires Massachusetts electricity distribution companies to procure 1,600 megawatts (MW) of cost-effective offshore wind energy by June 2027, with the first competitive solicitation taking place in June 2017. Since 2009, Massachusetts has been leading an intensive effort with the U.S. Bureau of Ocean Energy Management (BOEM) to establish leasing areas for offshore wind beginning 14 miles south of Martha’s Vineyard Massachusetts. This effort has involved extensive collaboration with a broad range stakeholders and resulted in accommodations to avoid important marine habitat, fishing grounds, and marine commerce routes, and most notably the reduction of the original offshore wind energy area by 60 percent. Three offshore wind developers have lease agreements to build projects in the federal waters south of Martha’s Vineyard, Massachusetts. New Bedford Marine Commerce Terminal – MassCEC manages the New Bedford Marine Commerce Terminal. The Terminal is a multi-purpose facility designed to support the construction, assembly, and deployment of offshore wind projects, as well as handle bulk, break-bulk, container shipping and large specialty marine cargo. The first of its kind in North America, the terminal has been engineered to sustain mobile crane and storage loads that rival the highest load-bearing ports in the nation. Stakeholder Engagement – MassCEC serves as a focal point for constructive engagement between industry, government and a wide range of non-government organizations and institutions on offshore wind topics. Since 2009 we have worked closely with Executive Branch agencies and BOEM to seek stakeholder input on the offshore wind energy areas. To augment this effort, Massachusetts formed a Fisheries Work Group and a Habitat Working Group to inform the work of BOEM’s Intergovernmental Task Force. As of early 2017, Massachusetts has held over 100 public and stakeholder meetings relating to the offshore wind energy areas, and other topics such as offshore wind transmission options and research and innovation. Environmental Characterization – In partnership with BOEM, MassCEC has sponsored multi-year (2011-2017) studies of marine wildlife focused on gathering baseline data to inform the federal permitting process and accelerate the responsible siting of offshore wind projects. The studies included underwater acoustic buoys and aerial surveys to assess whale, turtle, and avian activity in the wind energy areas. Metocean Data – MassCEC is partnering with the Woods Hole Oceanographic Institution (WHOI) and AWS Truepower to collect hub height wind speed and other metocean data near federal offshore wind energy areas using a WindCube LIDAR installed on a WHOI-owned platform located one mile south of Martha’s Vineyard. The first full year of data collection was completed in October 2017 and a second year of data collection is currently underway. Data and analysis products are available on MassCEC’s Metocean Data page. Supply Chain –MassCEC conducts ongoing offshore wind supply chain analysis and networking aimed at connecting local manufacturers, suppliers and service providers with offshore wind developers and major equipment manufacturers to ensure the greatest economic benefit for Massachusetts companies and workers. MassCEC is compiling a Resource Directory of Massachusetts companies qualified for specific roles in offshore wind. Ports and Infrastructure Assessment – In order to maximize economic development opportunities in Massachusetts, MassCEC is conducting an engineering assessment of 18 waterfront sites with potential to be redeveloped by private industry investment to support offshore wind component manufacturing, staging, and long-term O&M. Workforce – MassCEC develops and implements programs to ensure that Massachusetts workers have the skills, training and certifications necessary to participate in the offshore wind industry. In 2018, MassCEC commissioned an Offshore Wind Workforce Assessment to provide a comprehensive analysis of the workforce needs and economic development impacts associated with the deployment of 1600 megawatts of offshore wind in Massachusetts. On October 1, MassCEC released the Massachusetts Offshore Wind Workforce Training and Development Solicitation, responses to which are due on November 30. Transmission Planning – In 2014, MassCEC commissioned a report to analyze the transmission infrastructure necessary to interconnect future Massachusetts offshore wind projects to the regional electric grid. The report identified routes and interconnection locations where offshore wind energy can be connected to the ISO-NE grid. Research ­– MassCEC provides funding for academic and research institutions across Massachusetts to advance research and innovation in offshore wind development, technology and operations. Click here to read more about previous wind research awards.